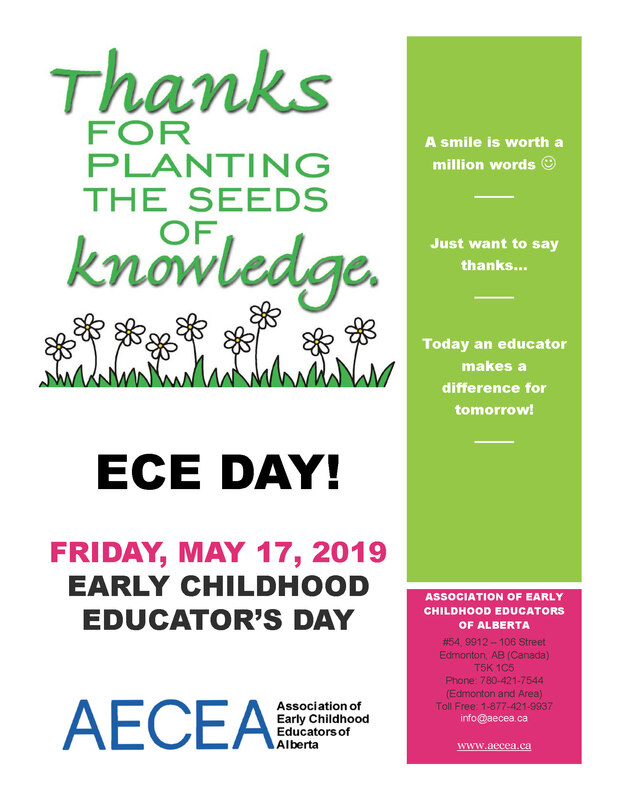 We invite the community at large to come together each year in May to celebrate the valuable work an Early Childhood Educator dedicates to their profession by celebrating in ECE day. Invite your local Mayor and/or Council members to tour an early learning and care program to see what it’s like in a day in the life of an ECE. Invite media to cover the insights of the purposeful work educators do in their programming and interactions each day with children, and families. Take nominations to recognize an outstanding early childhood educator, give recognition to the individual at a local celebration. Organize a family fun event or BBQ/picnic, inviting and recognizing the importance of early childhood educators. Have a local florist deliver flowers to early learning and care programs to show community appreciation. Put an ad in the local paper featuring an early learning and care program in your community and to give your gratitude for the difference they make! Invite the board of trustees to an activity in an early learning program, have media cover the importance of community involvement with children. Announce the significance of the day over the PA system. Give parents the opportunity to write words of appreciation for the early childhood educators. Provide a flower to each early childhood educator. Share a healthy snack for educators. Have the Board of Directors take educators out for supper to show their thanks. Parent committee can provide a family/staff event showing their appreciation for the work they provide for their children. Provide a certificate of recognition for the valuable work of an early childhood educator. Dedicate a bulletin board to the amazing work of an ELCC educator showing off the co-learning occurring on a daily basis. Post comments from parents and pictures from children. Have local businesses provide gifts and donations for gift bags for early childhood educators. Provide an opportunity for a staff appreciation day by inviting a motivational speaker, and self care activities. Have a massage therapist set up in the staff room for 15 minute massages during lunch breaks. Surprise educators by revamping the staff room with new décor or a paint job. Feature the special work educators do in monthly newsletters. Send an official letter from the board thanking early childhood educators for the work that they do. Create a learning story showcasing the special interactions between the children and their educators. Advocate by writing a letter to the ministry, local MLA’s, and other government officials on behalf of early childhood educators on current matters in the workforce of early learning and child care. Make a donation to a woman’s shelter, sponsor a child, or a local family in need on behalf of early childhood educators. Attach a word of encouragement to the educator’s lockers or in the communication book. Cost share in a professional membership to the Association of Early Childhood Educators of Alberta (AECEA), a provincial voice for early childhood educators. Host a hot lunch for early childhood educators during their lunch break in the staff room. This provides some ideas of the many ways we can show appreciation to early childhood educators and their important role they do in contributing in the lives of children, families, and communities. To download the poster, go here.